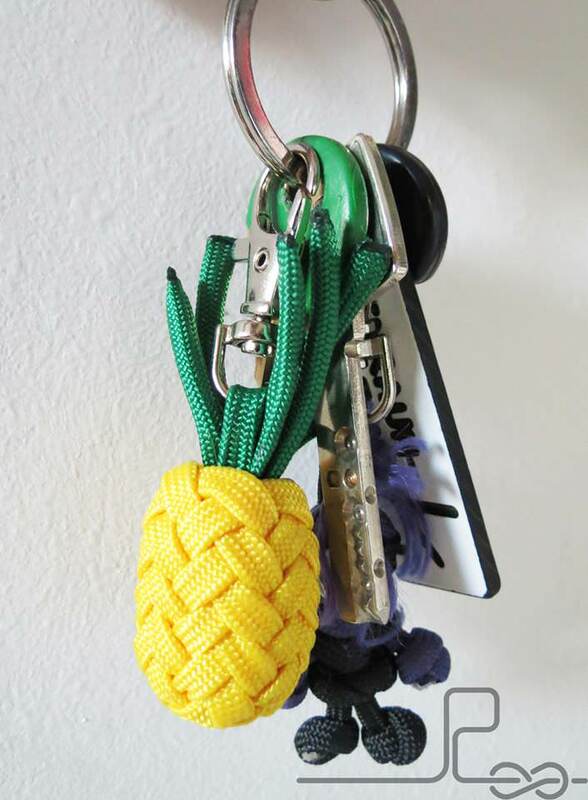 Why Pineapple crafts? To me, the pineapple is the king of fruit. Mangoes and passion fruit may be slightly tastier but they just don’t look as good. I hate to admit it, but I’m easily seduced by great looking packaging. As far as fruit go, the pineapple wins hands down in the looks department. Did you know that in some cultures the Pineapple is a welcome symbol? I don’t know why but every time I see a pineapple, it makes me smile. 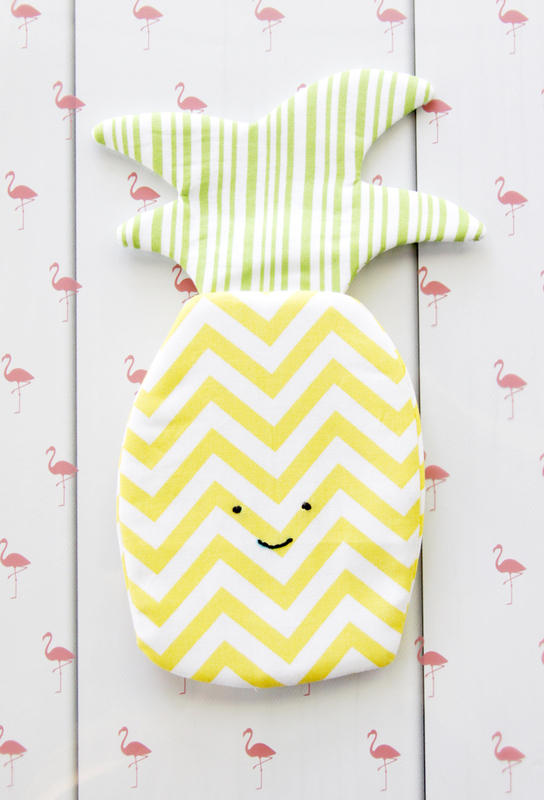 This combined with their funky looks makes pineapples a simple way to bring a bit of fun into your home decor. They also taste great. 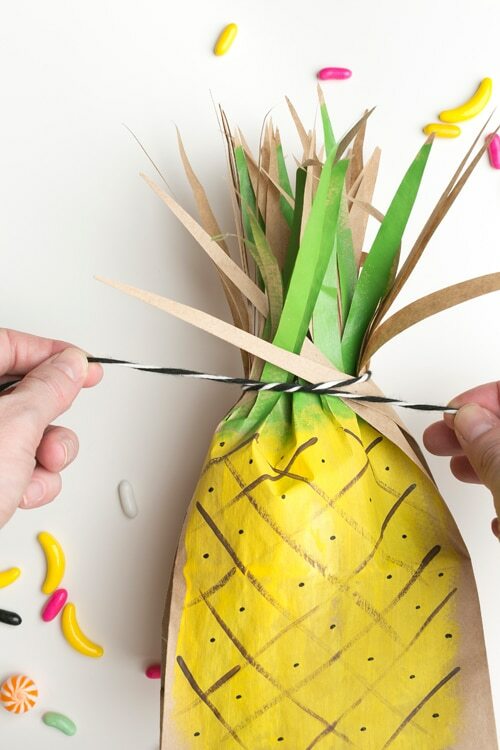 These are some of the best fun and cool pineapple crafts on the internet. These are so simple but would look great at any party or would even make a great way to wrap a small gift. I want one of these to wear with my summer dress on the beach. Now that’s what I call cool bunting, so summery! Free crochet pattern. 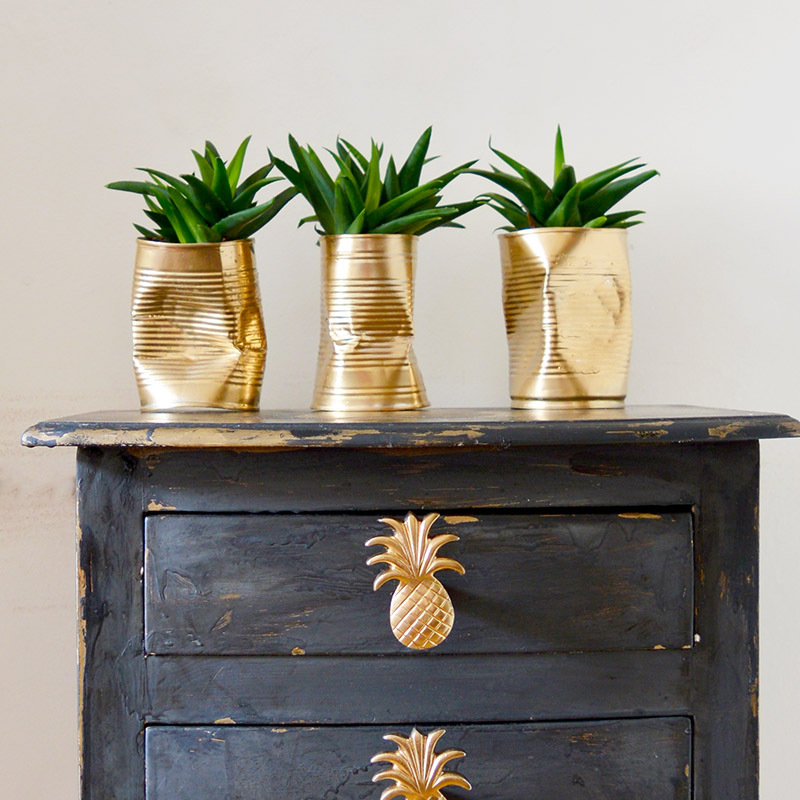 I had such fun giving my console table a shabby glam look with some gold pineapple stencils. 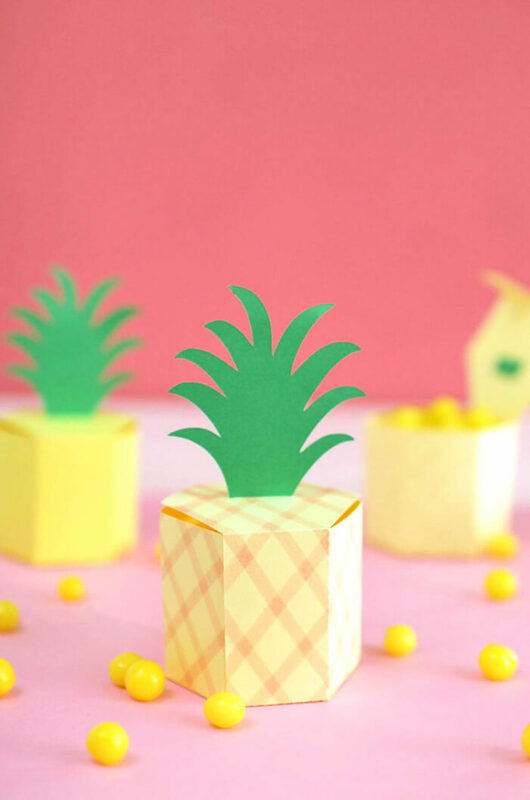 The crushed can DIY planters on the top also look a bit like little pineapples too! 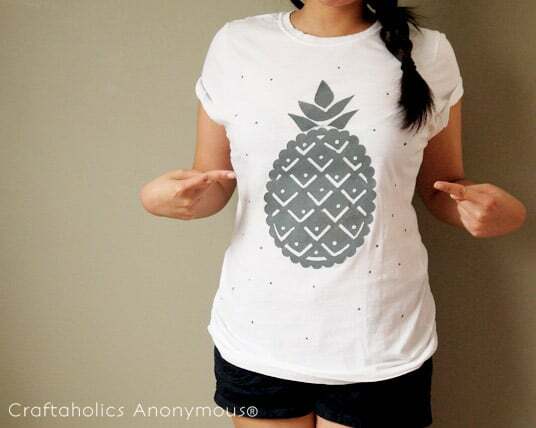 Stencils aren’t just for furniture, you can stencil a t-shirt and wear your pineapple craft. This is so awesomely clever, it’s made from plastic spoons. 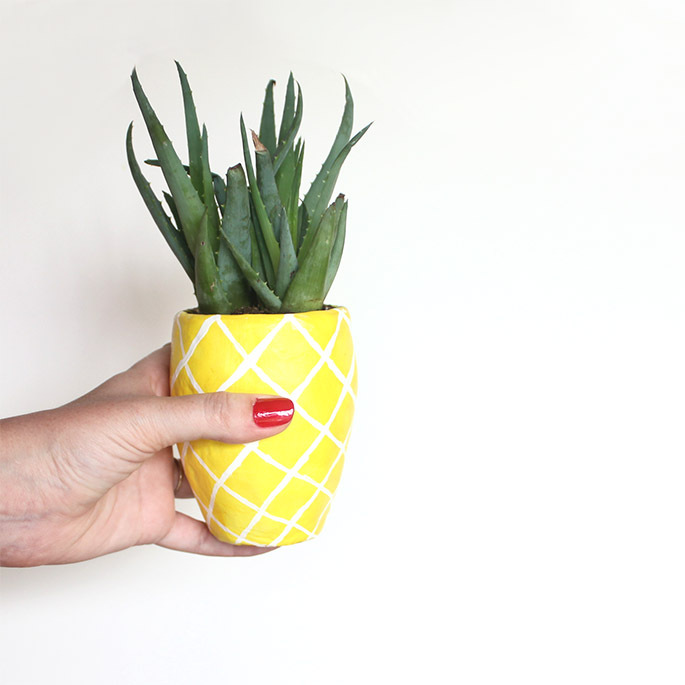 Plant a succulent in this cleverly painted planter and it looks like a pineapple. I love a good mason jar craft and this one is fun! Great fun for a party! A fun beaded craft for the kids, they would also make a sweet little present. This is such a clever upcycle the colours are gorgeous. 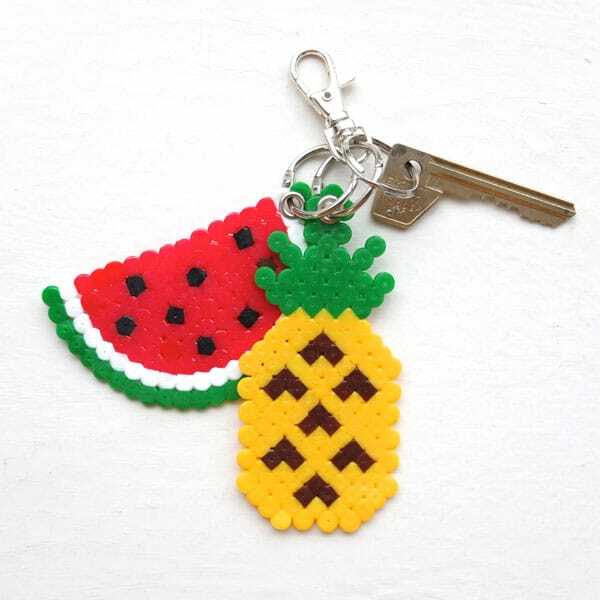 This is such a cute key chain. Again a great homemade gift idea, I can see my scouts making one of these. Full instructions provided. Another fun mason jar craft, that would make a great gift. 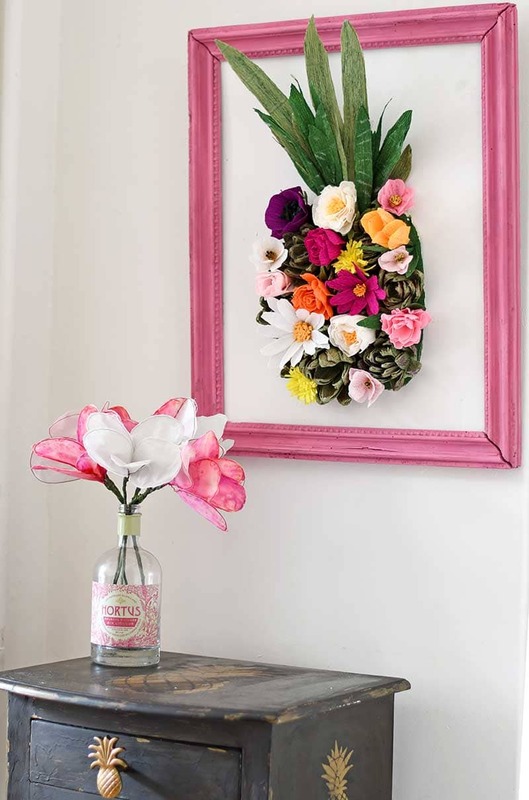 A fun home decoration idea. 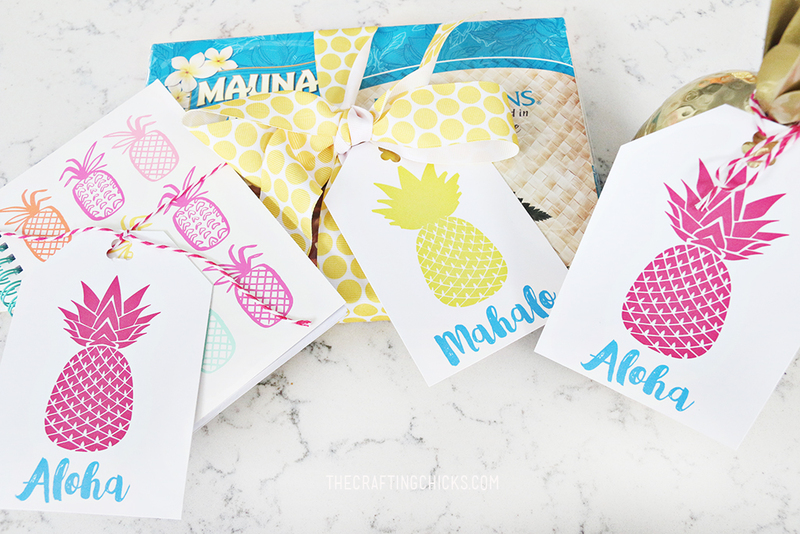 Free template to print off and make some fun Pineapple gift boxes. These tiny air plant holders are super cute. These are a free printable. Great for any gift. Another free printable, this one for your home. 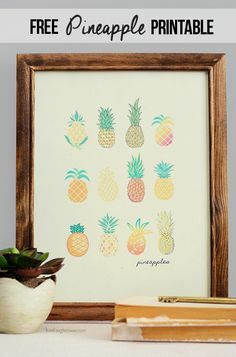 I’m definately going to be printing this goregous pineapple illustration out. 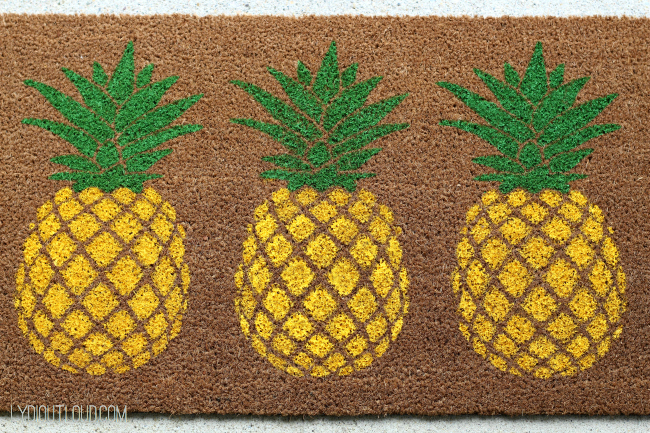 I said pineapples are a welcome symbol, therefore perfect for a doormat. 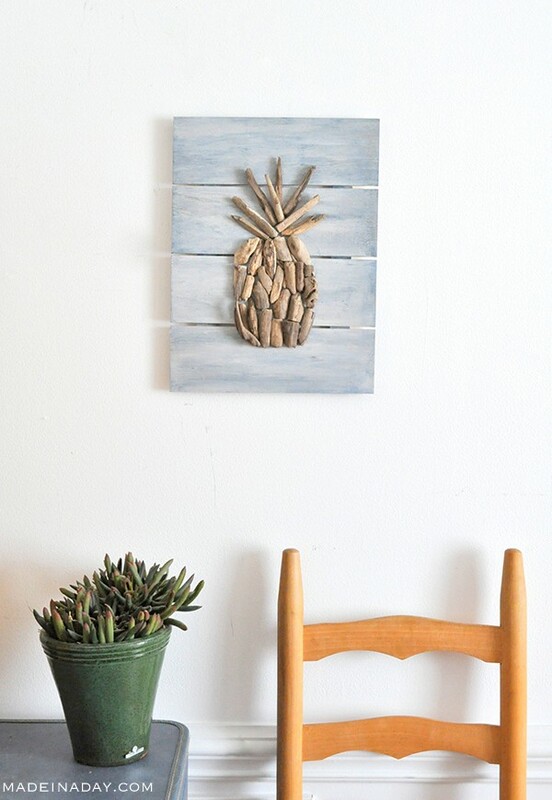 This driftwood pineapple is gorgeous. I’d love some of these on my sofa! This is a very clever upcycle. 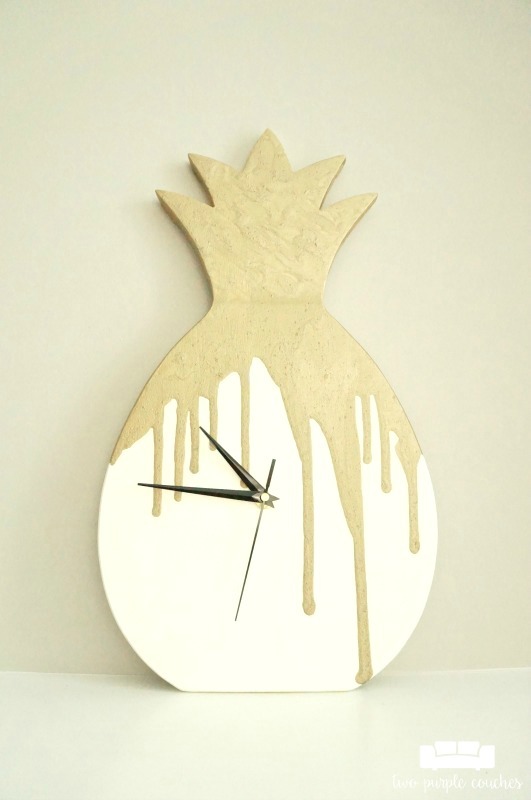 Who doesn’t want a pineapple clock in their kitchen? 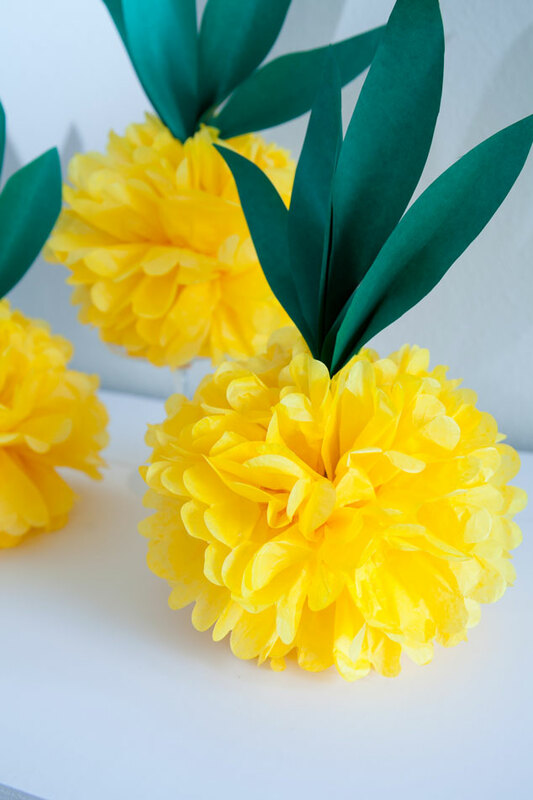 These tissue paper pom pom pineapples would make an adorable party decoration. This is a lovely little pouch from one of my favourite blogs. The smiley face gives the pineapple character. This has to be one of the most creative uses of a pinecone. Such a simple idea, pinecones really do look like pineapples. Especially when they are painted yellow. 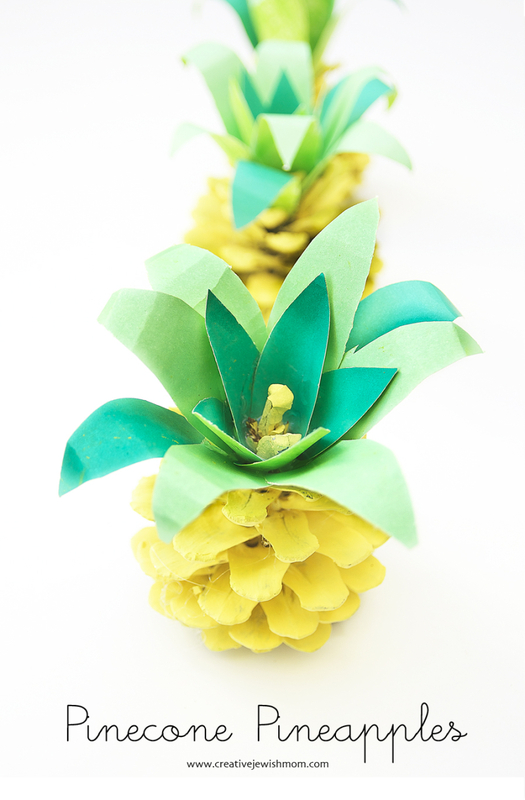 This paper pineapple wall decoration is such a fun summer decoration and would be great for a party. Thank you. 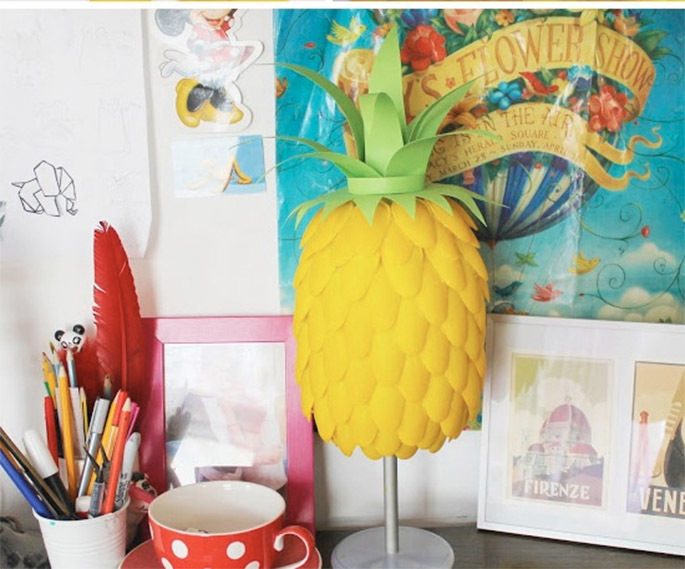 I like the idea of using the gold pineapple as a lamp base. Oh! 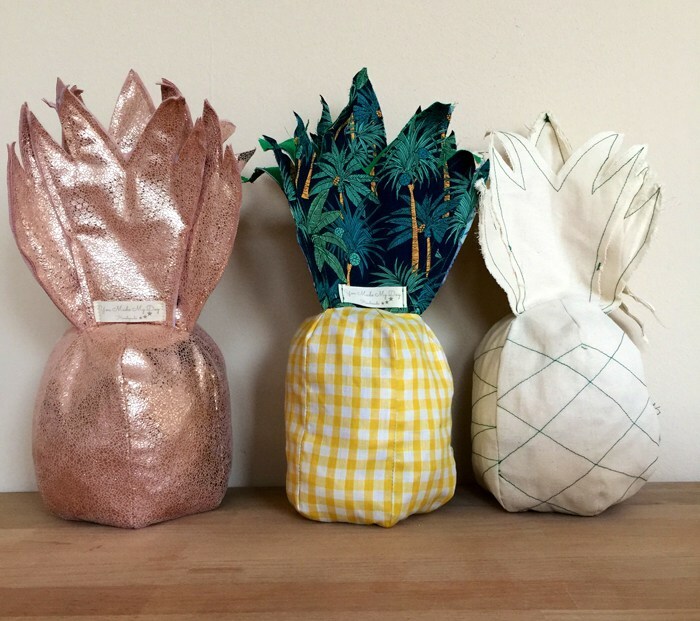 Thanks for including my pineapple cushions!! Loved making the pattern and tutorial so much! Would love to see other versions! You are welcome I love your pineapple cushions. Great projects! 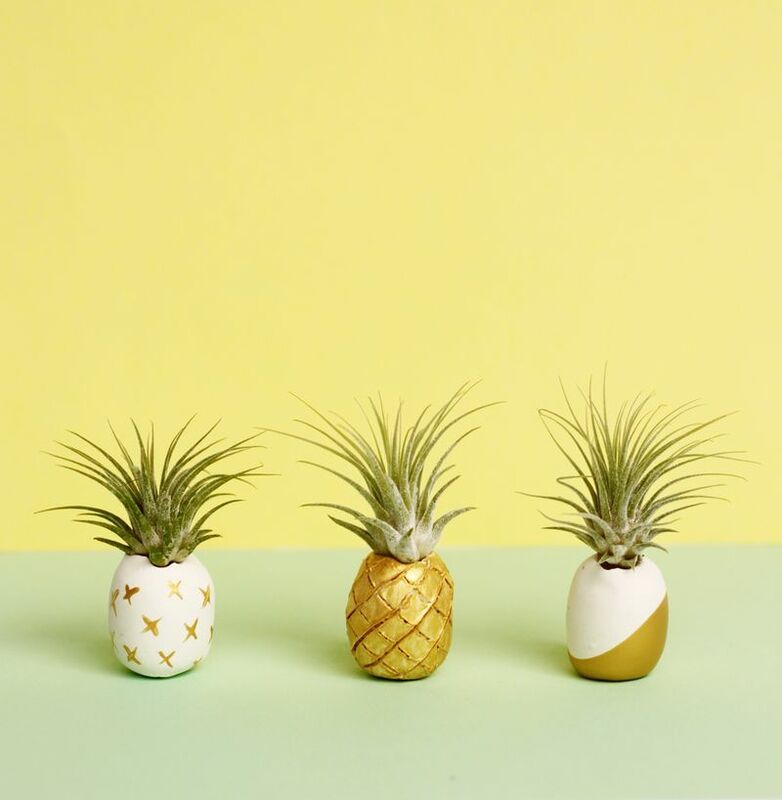 I love yellow and those tin can planters looking like pineapples a super cool! Thank yo for sharing! Thanks, that was kind of the plan to make them look like pineapples. Such fun for Summer! Adorable roundup. That clock is to DIE for. Thank you, I like the clock very much too! This was a huge roundup! 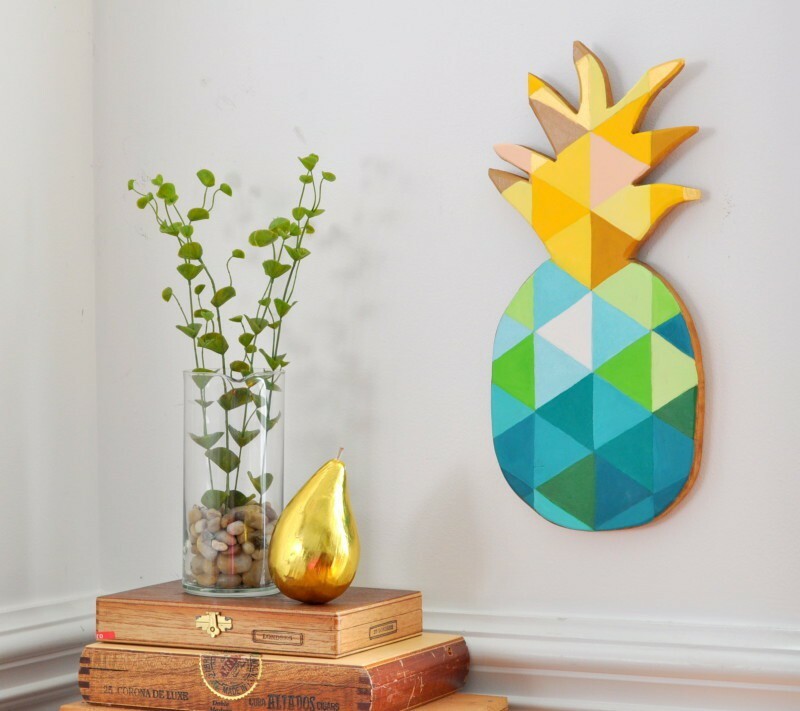 I love that you brought so many blogger’s creations together and who doesn’t love a great pineapple for decor or jewelry or any of the other amazing ideas. I love the necklace so much! Thank you for sharing this at TADA! Thursdays. Thank you! 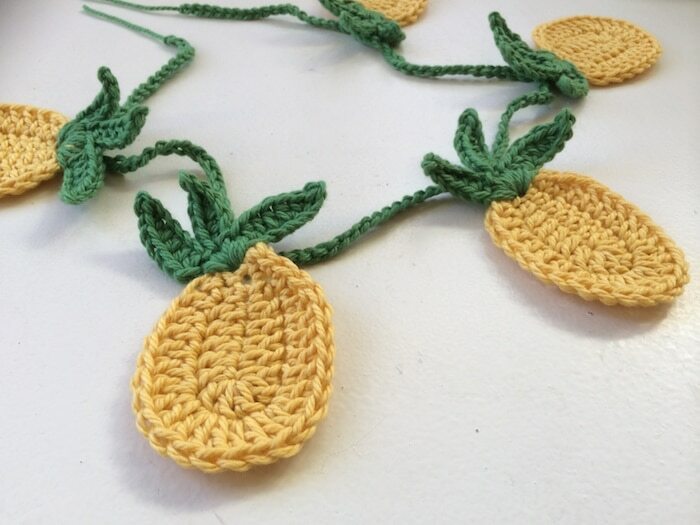 I just love a good pineapple craft. I’m actually in Thailand at the moment and I don’t think I’ve ever seen so many pineapples in one place before. Pineapples are really trendy right now. I was recently at Chapters and was very tempted to get a pineapple desk set. They make me think of Hawaii. How I love it there. 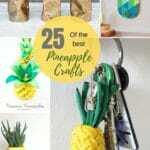 This is a really nice roundup, I enjoyed scrolling through all the different pineapples. Thank you, yes there is some lovely tempting pineapple things to buy at the moment. Cute roundup. I love fruit-themed crafts and these are great ideas. Thank you for sharing with us at #HomeMattersParty .We would love to have you again next week. 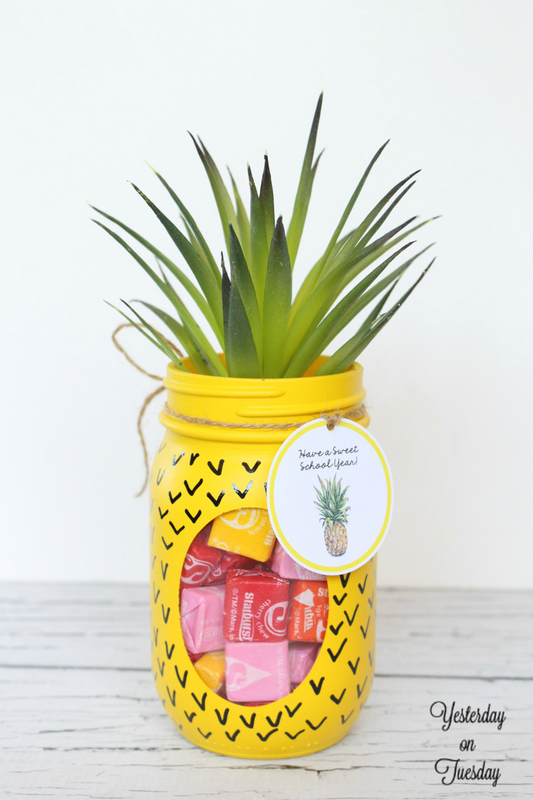 Thank you for sharing your fun pineapple round up at Vintage Charm! You must be in pineapple heaven with all those projects? Great roundup of so many cute ideas! Thank you, Toni I am in Pineapple heaven. 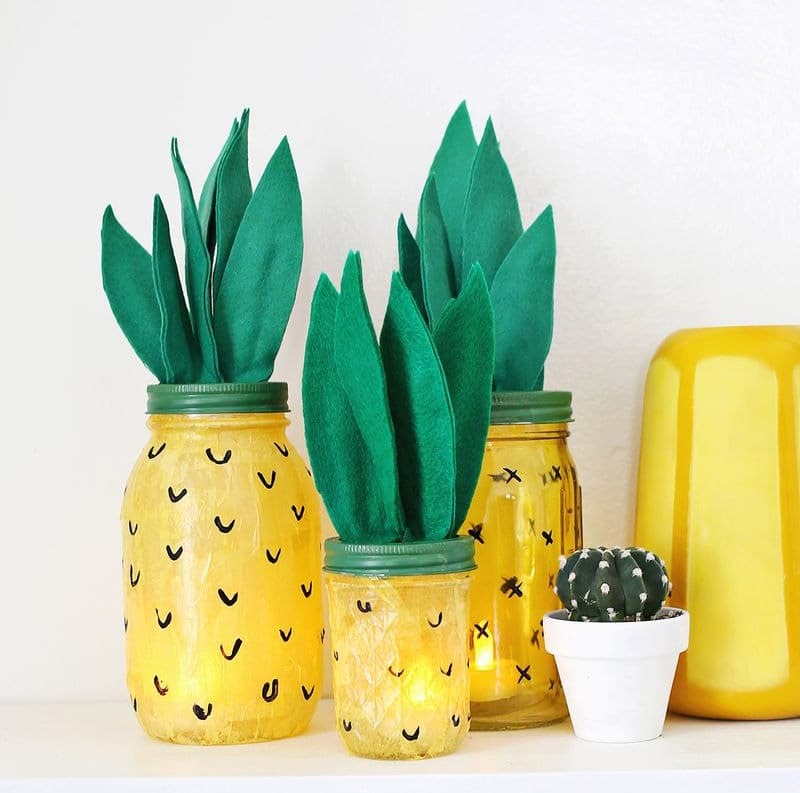 Totally love all these pineapple crafts! Saw your post linked up at the Creatively Crafty link party and had to stop by to see more! I love the symbolism of pineapples(welcome)so all of these projects are fantastic. Thank you, I love the symbolism and they way they look too! 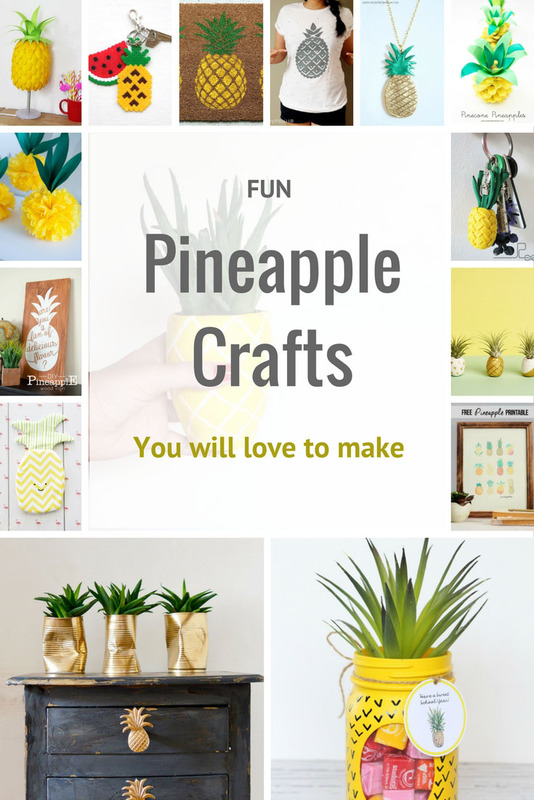 Claire, these are all such fun and creative pineapple craft ideas. I really like the bunting, the spoon lamp and your table. Thank you Keri. THe spoon lamp is very clever! This post makes me so happy… so many creative ideas! 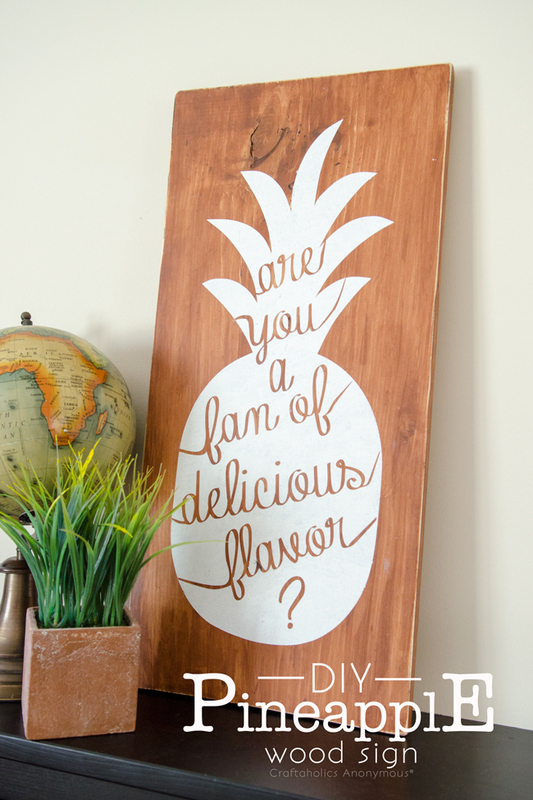 I love pineapples and this post makes me feel like summer is right around the corner! Thank you so much for including my doormat! Thank you, your doormat is a great craft perfect for a welcome mat! Great round-up! Pineapples are big here in the US in our home decor. Pinning. Visiting from Homemade and Handcrafted party. Thank you, they are quite big over here too! Thanks for including my drippy clock! There are SO many fun ideas here! Thank you. Your clock was a very creative upcycled and fun too! 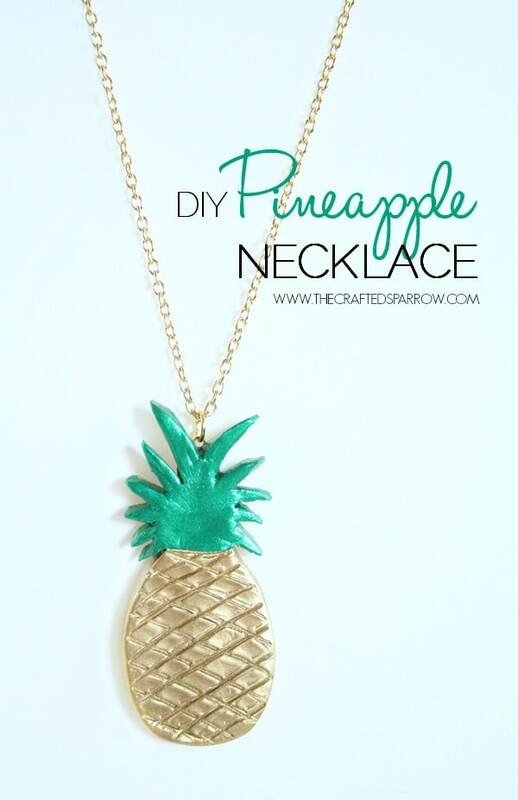 I love pineapples, so many great ideas!